Corrugated metal pipe section, Cote St Luc Collector Sewer. Picking up where we last left off, we eventually managed to find a safer way past the big slide where Controleman ended up taking a bit of a spill. 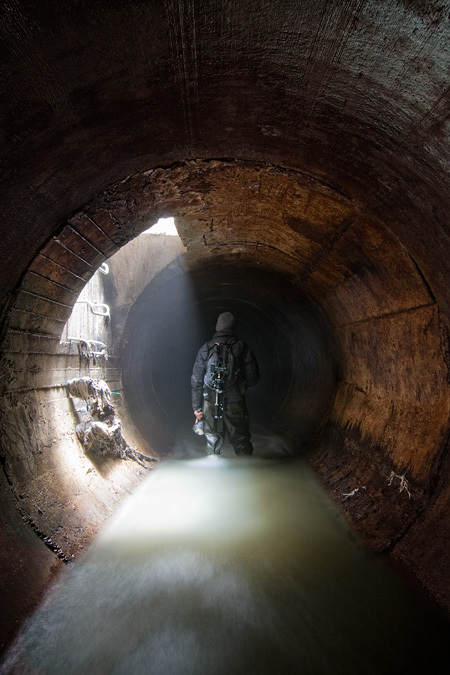 A manhole in a relatively discreet area nearby allowed us to climb back down and continue further upstream. So without further adieu.. Standing below a bit of natural light coming in through the manhole shaft. Judging by the pre-fabricated sections of reinforced concrete pipe, it looks as though this portion was constructed a bit more recently. Sometime around the 1970s, perfectly round RCP seemed to have become the standard material for sewers and storm drains in Montreal. 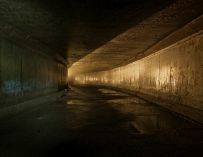 It can make for somewhat dull underground experiences, especially when long stretches of the stuff are involved. 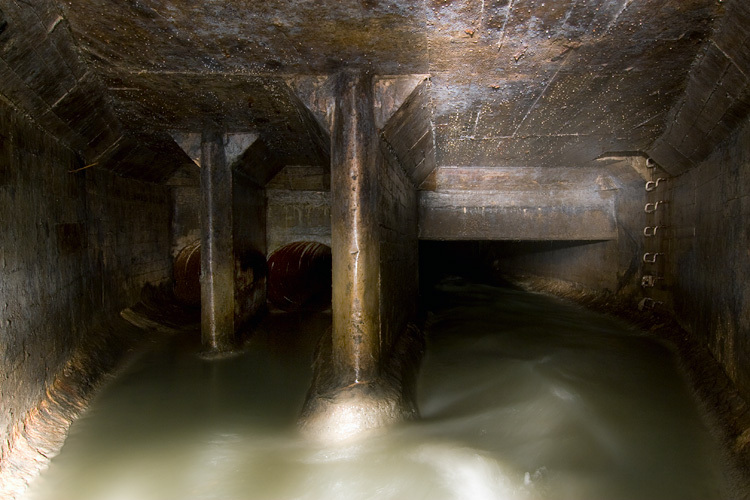 Fortunately, this particular sewer ended up having a nice combination of other features to help break the monotony. 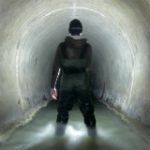 The visibility was fairly poor, which we’d later discover was the result of cold air blasting in through a little 6″ pipe. 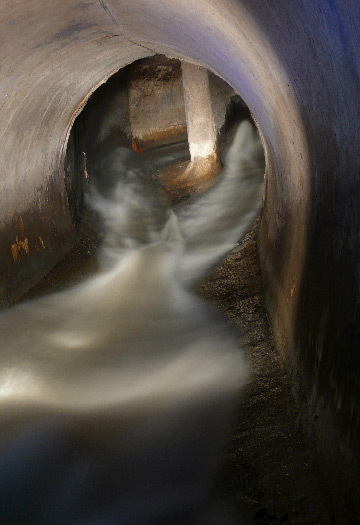 During the autumn and winter months, the air inside sewers stays a few degrees warmer relative to aboveground temperatures. When outside air finds a way in, it can can lead to somewhat unfavorable exploring conditions. In this case, a dense “fog” had filled the sewer. The lights of our headlamps only penetrated a few feet in front of us. Regardless, we began making our way northwards underneath Cote-St-Luc. Sloshing our way through the shin-deep water, we eventually arrived at a nice wide junction chamber. Nothing too fancy or out of the ordinary, but at least at this point the fog had subsided enough to make it a bit more practical to be able to take a photograph or two. nel58 and myself lighting things up. 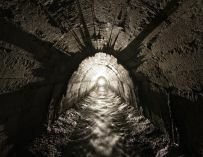 We chose to follow the smaller pipe to the right out of which we could hear the rumbling of water; a sign that something a bit more interesting lay ahead. 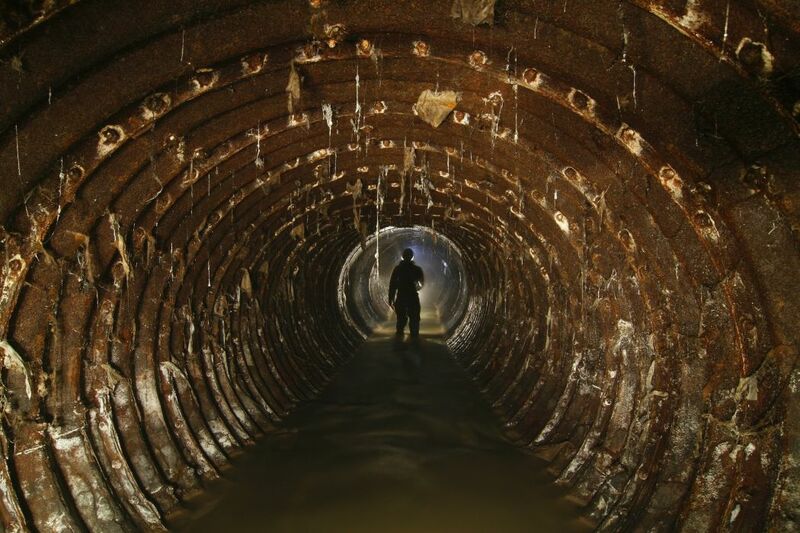 Fifty feet or so in, we found ourselves inside a rusted corrugated metal pipe. I have no idea why the change occurs, but it’s there. 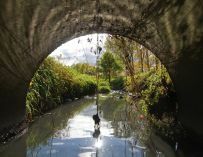 Maybe it’s a culvert that existed beneath a roadway before the rest of the sewer was put in place. As the picture below can attest it was a bit on the dirty side. 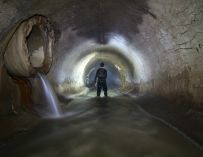 I’m always having problems convincing people that sewers aren’t as bad as they might imagine them to be. I’ll admit that a photo like the one below does little to support my claims. Fortunately, these places never smell as bad as they look. Honest. Being careful not to get a dangling condom, piece of toilet paper or god-knows-what-else in the face, we pressed forward. We eventually reached a lovely little chamber responsible for the noises we had started hearing from the previous junction. Accidental modernism found forty feet below. Sometimes it’s the little stuff that helps make things more interesting. In this case, a curtain of water falling over a diagonal ledge or reinforced concrete beams. 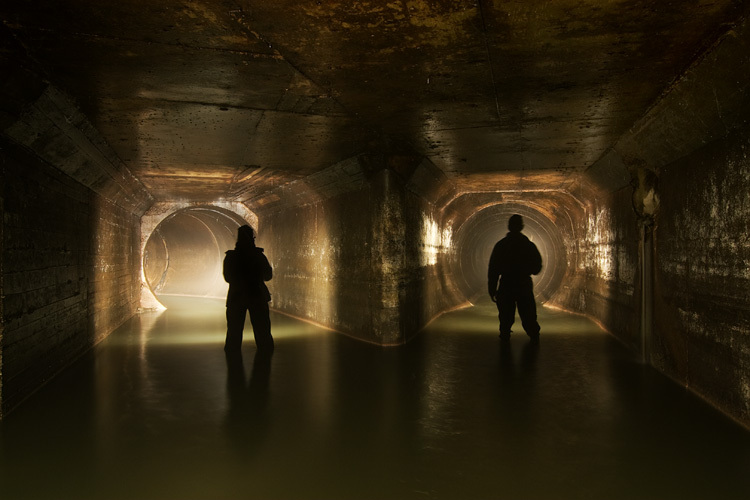 As much as traveling through pipes is a part of underground exploration (which I’ll admit can sometimes get boring), it’s this sort of stuff that we look forward to discovering the most. Since neither of the two pipes ahead of us were tall enough to stand up in and would likely only get smaller, we decided to head back. After returning to the first junction, we started heading up the pipe that ran off to the left. It didn’t take long before we realized it would probably be some time before we came across anything other than RCP. A basic system map from the 1960s shows the main arm of the sewer continuing on to the northern boundary of Cote-St-Luc. Reaching that point would involve walking against the current for a good 3 kms from where we were standing. Not feeling up to that particular task, heading back downstream from our entry-point seemed like the more appealing option. Odd engineering found at the end of the line. 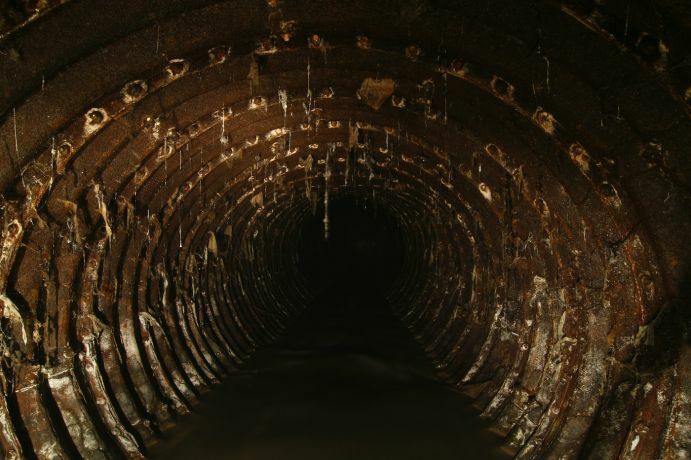 Two relatively dry corrugated metal pipes veer off to the left and the rest of the wastewater flows through the four foot high square section seen on the right. Shining my spotlight up through this part revealed no end in sight. I figured it was most likely going to be like this for the entire width of the railway yard sitting directly above us. Regardless, I started to crouch down through it. Soon afterwards, I found that the bottom of the floor dropped off abruptly to the point where I was now up to my waist in water. Realizing my backpack (and more) would probably get soaked if things got much deeper, we decided it would be best to turn around and call it a day. Can’t wait to see more! Keep it up! Wow the third picture is right below my house. 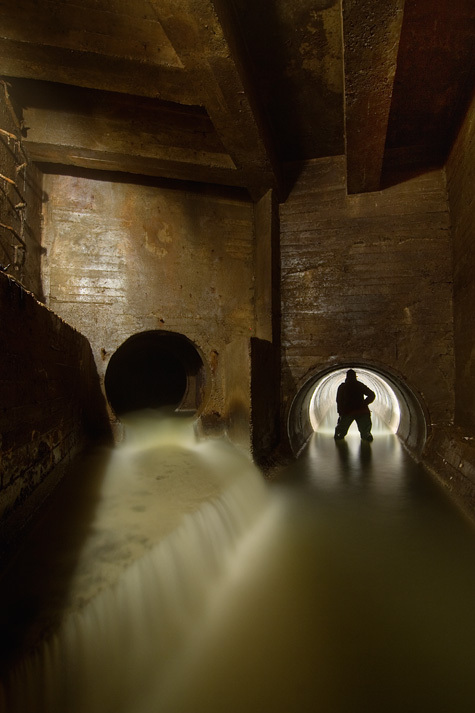 Dude I’m loving this blog, but I gotta tell you never had any idea this was below my house. Hope it wasn’t my condoms you ran into. I love your website. Congrats!! By the way, do you have an idea of the depth of this collector?